M. Hortensia Maior Bonae Deae votum solvit libens merito. 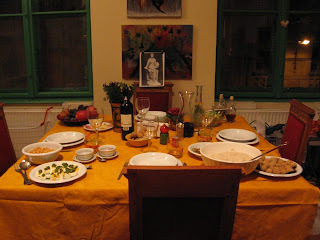 We had a wondeful sellisternium, the table was spread with a golden cloth, autumn flowers in various vases, Bona Dea's photo was mounted and set on a chair at her place. 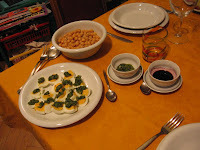 Livia Plauta made a Roman meal and it was delicious, we were also joined by her friend Lucretia Capillata. 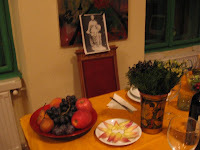 We praised Bona Dea, the goddess of women and homes and asked for favours. I encourage everyone to make a dinner, a sellisternium or lectisternium for the gods. It doesn't have to be elaborate, just set out a place and give the goddess or god the first and choice portions. May Bona Dea favour me, Livia and Lucretia for praising her name!! Bona Dea nobis fave!! Thanks for sharing this! Looks like a lovely tribute to Bona Dea. I hope I can join you all in person next time to honor this goddess. Or you can organize your own sellisternium to Bona Dea. Use the map to arganize it, and we can help you with setting it up. But remember, it would be for women only!